Last summer Thing One took his first missions trip to the DR. It changed his life. It grew his faith. It matured his outlook. I interviewed him for a blog post, you can read it by clicking here. This summer, both Thing One and Two went. Each of them had an amazing and unique experience. Thing One sat down to write thank you letters to his benefactors tonight. After reading (and weeping) over the letter – I am lead to share it with you too. The hearts of the youth never cease to amaze me. The youth mission served the poor in spirit and in those in financial and medical need. They loved on orphans and elderly; those strong and weak. Whatever love called for – these kids gave it. They even washed the feet of several people who were “living” in a home for the aged…(not in conditions that any state-side Sunrise Retirement Home offers, I assure you.) I am very thankful that the future of our world will be in the hands of such as these. Praise God for His goodness. Blessed are the peacemakers, for they shall be called children of God. Amen and Amen. Thank you for your prayers and support in regard to the Dominican Republic missions trip that I was blessed to attend. 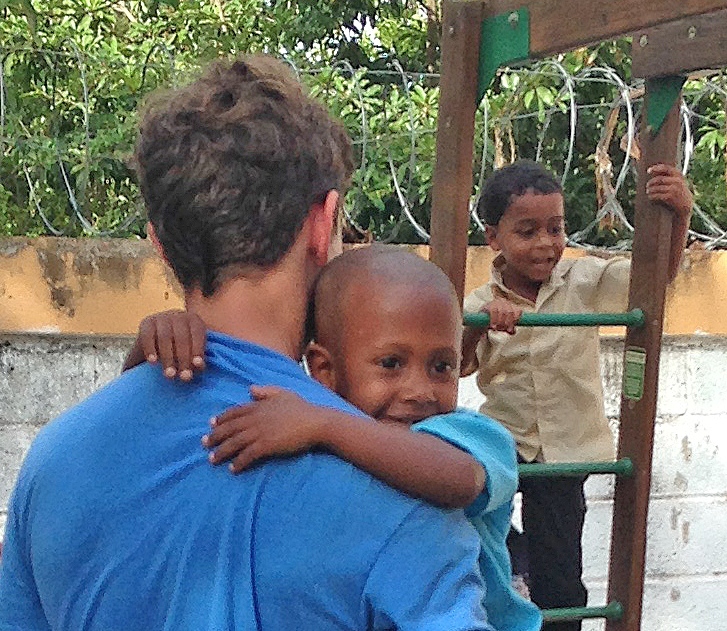 I cannot express my gratitude to those who helped me get to the Dominican. I do not only mean financially, but also spiritually. I know many of you prayed for my safety and for the trip to influence me and help me grow. As many can attest, prayer is more powerful than money. I felt those prayers. Once again I am extremely grateful for all of those who followed me to the Dominican financially and spiritually, it is no doubt that the trip would not have been possible without you all. I’m sure you all are anxious to hear about my experiences and what I learned from this trip. A few of you may remember the stories from last year about taking the kids to the beach, and how we acted as their protectors. Last year was an amazing blessing; but sadly I admit that last year I was intimidated by the whole mission process. This year could not have been any more different. I was counting the hours till departure, and was anxious to get to the people of the Dominican and give them everything that I could give. While last year consisted of pretty light work, this year was heavy lifting, long days and tons of exercise. By heavy lifting I mean KIDS, lots of kids! This trip my group worked mainly with kids, and when I tell you how excited I got when we got to the villages and the children would be waiting outside the bus for us…. I mean I was ecstatic! For me it was better than Christmas morning. Immediately after I disembarked the bus I would pick up a kid or two and I would hold the hands of two other kids, usually followed by a few other ninos. It must have looked pretty weird seeing me walk down the street, I was a living “child bus”, but I didn’t care – those kids are my passion and the love I have for every child I got to know is unexplainable. “I love you” is a weird thing for me to comprehend, because for me love is not a feeling and it is not an emotion. Love is action. This comes into my conversation about the kids I met because I didn’t know these kids, I don’t know their life story. By modern definition I am incapable of loving them because I don’t know them. But modern definition is tepid. Love isn’t something that is acquired over time or experience, it is something that pours out of your heart and very soul if you are willing to tap the reservoir and leave yourself at the hands of others. That is the way I felt and feel towards those children, I LOVE each and every one of them, not a romantic love but a wholesome, unselfish love. Every time I leave the Dominican I feel as though I left a piece of myself behind, because I have, I have left a piece of my heart with every child and person that I had the fortune of meeting. I miss them all and I hope to be able to see them again, but if not I am hopeful I see them when I get to heaven. So, please take a moment to let what I have said sink in, and appreciate those who you say you love. But remember love is action, not a state of being or a feeling. I liken it to this – How can one be a runner if they don’t participate in the action of running? I don’t want anyone to read this and think that it has some correlation to my personality or my level of maturity or godliness or whatever you want to think. I want you to consider as if the message of love in this letter is from God. You see, I wasn’t planning to write about love, but as I sat down to write this letter, I was convicted in my heart to share how important it is to love… as much as you can in this short experience that we call life. Life and Love are only two letters away from being the same thing, so what is stopping any of us from truly loving in action and spirit? I love you all and I hope that God will bless you with the opportunity to experience love through action, and I pray that one day we all will be able to share our love to those who don’t have any love. There are so many people everywhere who need the action of love. We don’t have to travel to places far away… it could be that homeless man on the curb that you pass everyday on your way to work, it could be that child admiring you from across the room who doesn’t have a father or mother figure, it could be that angry McDonald’s worker who has gotten your order wrong three times… but consider that little may we know in our “hunger rage” that she was recently diagnosed with cancer. I don’t say this as a speech or a sermon; I say this as a person to another. Let’s love each other, let’s all consciously love everyone. How much better would the world be if everyone loved everyone? If we took two minutes out of our “busy” life to talk to the homeless man or that McDonald’s worker, or that admiring little kid. So, thanks for reading this through and for all your prayers and support this summer. I hope that I have written what God wanted of me. I thank you all for the opportunity to learn how important the action of love is. Wow this letter made me tear up! Thank you for sharing! !